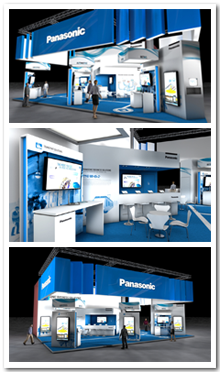 Panasonic will demonstrate its end to end business solutions at this year’s Mobile World Congress (MWC) in Barcelona. Visitors to the Panasonic booth (Hall 6, Booth H31) will discover a host of business solutions aimed at improving productivity and working lives across a range of industry sectors, including transportation, logistics, retail, automotive and the cloud. Panasonic’s successful range of Toughbook devices and 4K Toughpad tablets for business will be on stand. For the cloud, Panasonic will showcase www.cameramanager.com, which provides video surveillance-as-a-service (VSaaS), enabling businesses to monitor and store security footage remotely. Panasonic’s wired and wireless, cloud enabled communications equipment enables smoother business communication. Panasonic’s new ‘cloud ready’ handheld Electronic News Gathering (ENG) camera with wireless connectivity will also be on stand. The AJ-PX270 enables recorded content to be shared almost instantly and accessed from anywhere. In transportation, the booth will feature LED displays and a 360-degree Dome Network Camera that offers Full HD images and intelligent face detection, an ideal surveillance solution for vehicles at bus and train stations. Looking to the future of retail, Panasonic’s Business Intelligence Video Systems (BIVS) means retailers can now execute more targeted promotions and optimise resources with age and gender profiling for marketing analysis. Seamless video walls and large LED displays demonstrates a range of promotional and customer engagement tools. To find out more visit Hall 6, Booth H31 at Mobile World Congress (MWC), 24th-27th February 2014, at Fira Gran Via, Barcelona. Panasonic to broaden the Toughpad range with next generation rugged 5-inch device for mobile working: Voice and data capable with Microsoft Windows Embedded 8 Handheld operating system or Android. Click here to learn more.